Home/Knowledge Base/Questions & Answers/How much does a database server cost? How much does a database server cost? As your company grows, you create more and more data. That information, whether it's customer profiles or the back-end of an app, has to be stored somewhere. To date, you've been using spreadsheets. You've started to understand why you need a database server for your business. This computer stores information you don't need immediately, but keeps it accessible. All you have to do is query the server to retrieve what you need. One thing has held you back. How much does a database server cost? The cost of a server is dependent on a few different factors, including your business needs. This guide will help you understand server costs, as well as help you begin to assess your own needs. 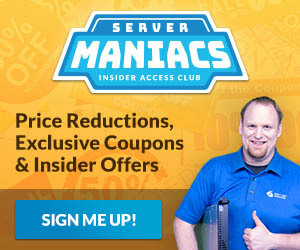 If you're a small business owner, you probably want to keep server cost as low as possible. What are the absolute minimum requirements for a database server? Minimum requirements depend a bit on what database software you want to run. MySQL, for example, runs on as little as 2GB of disk space and 128 MB RAM. Most servers will exceed these requirements. The cost of a database server will hinge on what you need for your business. The good news is unless you're a huge corporation, you can get by with a relatively simple set up. You'll need to determine how much space you'll need on your server. There are online calculator tools that can help you get a rough estimate. Of course, you can also talk to database server providers to assess your needs as well. Companies will quote the price of hardware alone when it comes to database servers. This includes the actual computer and components, such as processors and memory. It doesn't include the software you'll run, such as the operating system and other apps. Without them, your database server won't be much good. When you're asking, "How much does a computer server cost? ", be sure to factor in all the necessary components. The computer itself may not cost much, but the software can set you back if you're not careful. Administration is Another Key to Answering How Much Does a Database Server Cost? Another factor in the cost of your database server will be the administration of the server. Even if you planned to buy your own server and keep it in house, you would still pay for administration. Someone has to care for the server. It will need to be installed and maintained. In time, you'll need to upgrade it. Administration accounts for the bulk of database server cost. You should plan for installation, maintenance, and replacement. Is it Time for a Database Server? If your company's information has become too unwieldy, it's time to consider a database server. Once you've answered the question, "how much does a database server cost? ", you can get started budgeting and researching. The right server provider is out there. If you’re ready to get started right away, ServerMania’s Hybrid Servers with 8GB of RAM and 110GB SSD start at just $29 per month and would provide sufficient resources for a modest database server setup.